3. Determine if you’re dealing with the decision maker. Negotiating with someone other than the decision maker never works. A key part of your selling process should be finding out early if the person to whom you are talking is actually the decision maker. The number of salespeople who spend time with people other than decision makers is staggering. It occurs far more often than we realize. Sometimes it’s an intentional strategy used by the customer, and other times it’s merely due to stupidity – or, as I see it, timidity on the part of the salesperson and/or customer. In either case, it results in lost time and often lost sales. The selling process is about making sure the person with whom you’re dealing is not an agent of the decision maker or someone who is simply too nice to tell you they’re not the decision maker. A key question to ask early in the selling phase is how the customer has handled other buying decisions similar to what you’re asking. What you’re listening for is a sense of confidence on the part of the customer that they have done this before. You can’t assume that by merely asking the customer if they’re the decision maker that they are going to come clean with you, especially if they aren’t the decision maker! You can, however, gain an indication in their tone of voice, their body language or verbal cues as to whether they are the decision maker. If you do determine the person you’re dealing with is not the decision maker, you don’t necessarily have to terminate your discussion. No, what it means is you need to be careful as to what you share and, more importantly, to not give any indication as to whether you would be willing to negotiate. Use your time with the “non-decision maker” to learn new insights that will assist when you do find yourself dealing with the decision maker. Many times the non-decision maker will be a key influencer, so it is crucial you help them feel confident in you and your proposition. 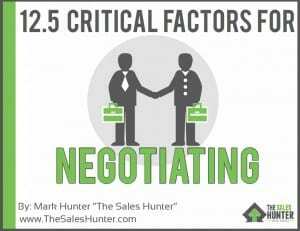 This could ultimately be a key factor in being able to close the sale without negotiating. Your objective is to never allow yourself to negotiate with anyone who is not the decision maker. Otherwise, you will wind up having to essentially negotiate twice. I can’t find too many good things that can come out of a transaction that requires two negotiations.